The Nine Mile Restaurant sits rather inconspicuously on the east side of U.S. 27, and motorists unfamiliar with its excellent food and rich history often drive by on their way to Decatur without giving it a second look. They shouldn't. The tavern and one-time inn is one of Allen County's treasures - very likely one of the oldest, if not the oldest,restaurant in the northern part of Indiana. To appreciate the restaurant's history, one must go back to the early 1830s and the pioneer settlement of what became Marion Township. Several ancient trails ran through the area, including Wayne Trace, through which Anthony Wayne's army had marched after leaving Fort Wayne in 1794, and the Piqua Road, which was surveyed in 1830 and made use of what was probably an older Indian trail. This road became what is now U.S. 27. In the 1830s, however, it represented one of the few paths a pioneer had for reaching Fort Wayne - once considered a far-away place from the more settled parts of central and southern Indiana. The land was so marshy that travelers on the road often had to fell trees and find parallel paths in the woods to get around the thick mud that rendered the road impassable. Pioneers began settling Marion Township in 1832. Philo Whitcomb, one of the first to arrive, established a post office at a place called Root near what is now U.S. 27 and Flat Rock Road. Then in 1837, John Karn opened a tavern at the site of the present Nine Mile Restaurant. As the Piqua Road improved, a stagecoach line was established, and Karn's tavern became an important stop. 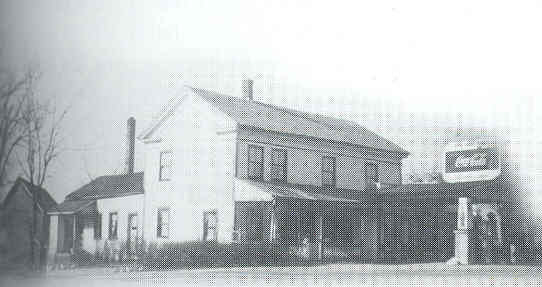 In 1850, John Holmes acquired the tavern and rebuilt it in a Greek Revival style, calling it Nine Mile House, because it stood exactly nine miles from the Allen County Courthouse. The site became one of the most important gathering places in the southern part of Allen County - a place where travelers spent the night and where pioneers met to exchange news over a pint. A series of owners followed Holmes. At one time, it was known as Bubb's Nine Mile after its then-owner, Anthony Bubb. 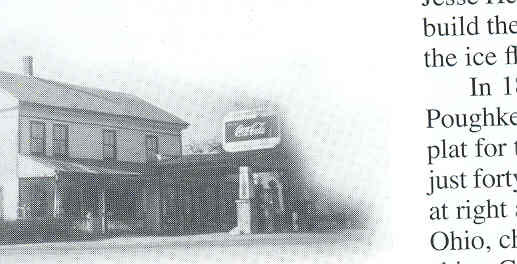 The oldest known image of the structure, shown above, dates from the 1930s, when there were gas pumps and a Coca-Cola sign in the front. Later the structure underwent a series of significant renovations that changed and greatly expanded its appearance. Today the restaurant is painted brown, but the original roof-line can still be seen within the other additions. Nine Mile is popular with residents in the Hoagland and Poe areas, but it is less well-known to Fort Wayne residents. It has an excellent menu, with barbecued ribs being one of its specialties. The cuisine is very much of the down-home variety, and while I don't profess to be a restaurant critic, I have always found my visits there enjoyable. My wife, who has deep ancestral roots in Marion Township, likes to speculate that many of her ancestors must have eaten there over the last century and a half. We enjoy the ambiance, even if the interior isn't designed to be historic. We know that buried deep within the walls is still the 1850 structure. Nine Mile is well worth a visit. Plan on having an intimate dining experience, with tables placed close together, and with excellent service. While there, you can celebrate how unusual it is for any business, especially a restaurant, to operate continuously at the same location since 1837.